Will a Multipolar World Emerge from the Post-Cold War Chaos? 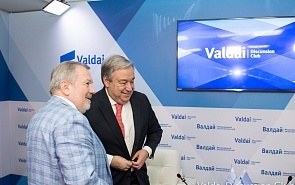 On Thursday, June 21, the Valdai Club hosted a meeting with António Guterres, Secretary-General of the United Nations. Experts of the Club and journalists discussed with the distinguished guest the UN role in the contemporary world and the prospects of emergence of a truly multipolar world order. ﻿﻿On June 21, 2018, at 13:30 UN Secretary-General António Guterres will meet with experts of the Valdai Discussion Club.